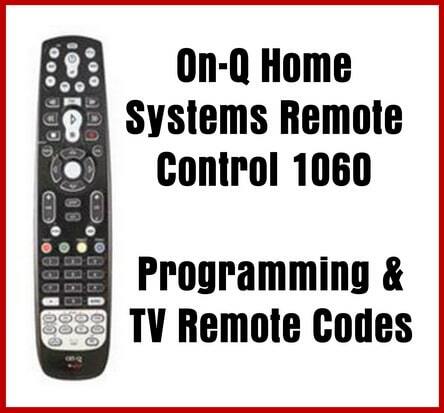 The On-Q Home Systems Remote 1060 remote lets you control up to 8 devices with one easy-to-use, compact unit. Out of the box, your remote is ready to control On-Q systems from any mode. After installing batteries, you can program the On-Q universal remote control to control your TV, VCR or DVD, Cable or Satellite Receivers, Amplifier or Tuner, and Auxiliary devices. To program this remote to control home theater devices, follow the steps below. Before proceeding, find the codes for the devices you want to program in “Manufacturer’s Codes” on the bottom of this page. 1 – Turn on the device (for example, DVD player) and, if needed, load media (for example, a DVD). 2 – Press a device key on the remote that you wish to program (TV. VCR/DVD, CBL/ SAT, etc.). 3 – Press and hold SETUP until the red LED blinks twice, then release. 4 – Enter the first five-digit code for the device and brand that you wish to program. The LED blinks once as each digit is entered. If the code is valid, the LED blinks twice. NOTE: If the LED does not blink twice, repeat steps 2 to 4 and try entering the code again. 5 – Aim the remote at the device and press Power Off. The device should turn off. If it does not, repeat steps 3–5, trying each code for your brand until you find one that works. Need help, please leave a message below and we will assist you.